I want you to ask yourself this question? Do I act like a Martyr? Think about this for a while and look hard. 1. Do you complain that you are the only person who ever does anything around the house? 2. Do you throw in the towel when you clean something up and then 2 hours later it is messed up again? 3. Do you pout, when you can’t get your children or your husband to do their fair share? 4. Do you know what their fair share really is? 5. Do you only clean when you are mad? 6. Do you hear harsh words come from your mouth, when delegating jobs? 7. Do you find things to do outside the home that gives you an excuse for not taking care of the house? 8. Do you say,I have worked all day, I just don’t feel like cleaning the kitchen. 9. If you cook, do you refuse to clean up afterwards, because you did your part? 10. Do you complain about all the emails? I get emails every day, asking, “How do I get my family to help?” My response to them is to set the example and quit being a martyr. It is pretty harsh. Your attitude about housework has got to change. It is your responsibility to nurture your family. I know this sounds backwards from the current way of thinking. I believe that if you will bless your family with taking care of yourself and the house, that you will see a difference in their attitude as well. How can you fuss about your children having a messy room, when you can’t walk in yours? How can you order your children to put their toys away when your crafting stuff has been sitting on the dining table for 3 weeks? You know where I am going with this. We can not expect our children to do things that we don’t do ourselves. Do you understand this. You have to practice what you preach. When they see you doing the things that you have only fussed about, they will start to follow your lead. You are the leader in your home, as you go, so does the rest of the house. Many of you have seen this work. Please send me testimonials of how your family has jumped on the bandwagon and started to do their part to keep the house nice. Your attitude makes all the difference. Would you listen to me, if I were like Martha Stewart with a Born Organized attitude? I don’t think so. You hear me, because you know that I am just like you and I have found a way to over come my CHAOS. I make mistakes, but I tell you about them, so you know that I am human and a real FlyBaby just like you. I struggle just like everyone of you. Quit being a martyr! Do the things that need to be done to get your home in order. If your children are not doing their jobs around the house, then take them back and do them for yourself. Not forever, just until you set the example and can delegate again with authority. I had one Mom who could not get her kitchen clean, because her son would not empty the dishwasher when she asked him to. It was his job and she was not going to do it for him. I suggested that she take the job as hers and give him something else to do. You see the kitchen being clean keeps the rest of the house in order. A messy kitchen migrates to the rest of the house. Her stubbornness was affecting her ability to do her routines. The routines not being done were hurting the whole family spiritually and physically. Tonight I would like for you to sit down with your family and apologize for not setting the proper example for them. Tell them about your routines and about FlyLady. Ask for their help in establishing your routines. In other words have a family meeting. Be honest! Kids love it when you apologize. This lets them know that you are human. Tell them your goal of a chaos free home and ask them for suggestions. Don’t just lay down the law. I think you may be surprised to see their reactions. Next assignment. Do you have your routines written out on a piece of paper? Listed in the exact order that they need to be done. If you have to use mine as an example until you can edit them to be your own. This is a start. I don’t expect you to do them all at once, this is a goal. I keep my routines in a notebook that lives on my kitchen counter. I call it my Control journal. It is just a pretty notebook that holds my routines. I also keep a dry erase marker with my notebook so I can mark through each item that has been done. The routines are in sheet protectors. I just love to see a whole sheet of items marked through. I want you to FLY! Being a Martyr keeps you Earthbound! If you find that your perfectionism keeps you from building your own Control Journal; we have one available in the FlyShop ready made for you. This 17 Month Calendar is large enough to hold your family’s busy schedule! August 2016 -December 2017. This is a great way to keep your family organized! 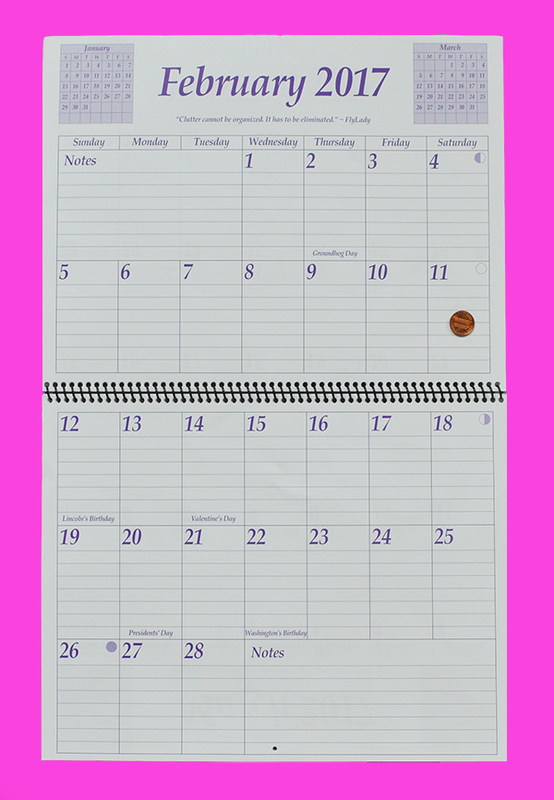 Check out FlyLady’s Calendar Tips! This entry was posted in Morning Musing. Bookmark the permalink.